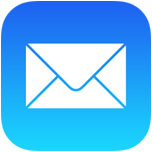 The iOS Mail app will automatically suggest recently used email addresses in the recipient feel when compiling a new email message or forwarding an email. While this is often accurate and helpful, sometimes an unwanted email address can pop-up in the automatic suggestion list, as can email addresses of people who are no longer in use. 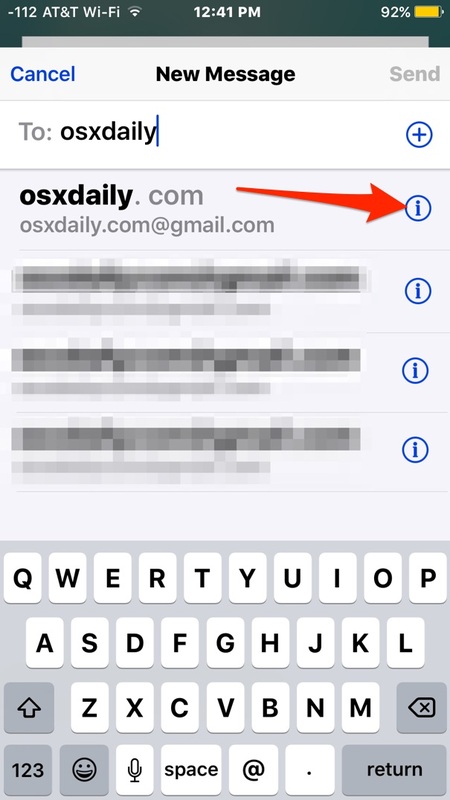 With a quick trick, you can clean up the recent email suggestion list on the iPhone, iPad, and iPod touch, and rid iOS Mail of any unwanted recommended email addresses and contacts. Note this relies on email addresses you have actually reached out to and communicated with before, making this different from the “contacts found in Mail” suggestion feature of iOS, which can also sometimes incorrect contact information and can be disabled separately. This works the same on iOS Mail for iPhone, IPad, and iPod touch. Once a contact has been removed from the suggested list they will not appear again unless the same email address is used again continuously for a while. This can be very helpful to clean up old email addresses from the ‘to’ suggestion field, or to remove a recommended address that may no longer get much use. You’ll find this useful if coworkers, friends, or family have changed their email address recently as well, since it’s pretty frustrating for all parties involved to have emails being sent to the wrong address and never get a reply if it’s no longer active or checked often. Note this only removes the contact and email address from the suggested email list that were recently used. 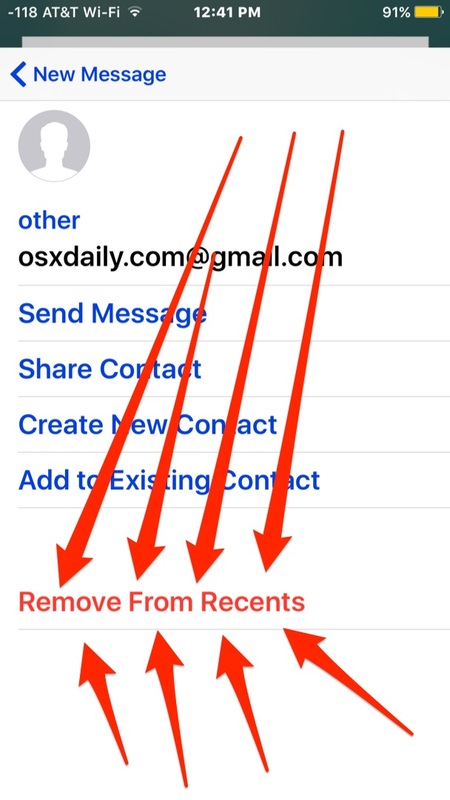 This won’t delete the contact from your general address book, if you do want to remove the contact from the iPhone you can do that here via the Contacts app in OS X, iCloud, or on iOS. Removing an email address from recents works as described but the “remove from recents”, option disappears after a very short time. Therefore unable to complete the task. When closing and repeating, exactly same result with the same unwanted address. What if the remove recent is’nt there. I too have similar question. The ‘i’ button and ‘remove recent’ isn’t present on all addresses, most typically the ones I want to remove. I have this same issue – the blue “i” is not beside the majority of entries I want to remove. 1. Save the contact’s details, perhaps by screengrabbing their entry in your contacts. 3. Return to mail and the blue circle around the “i” showed up and then followed the steps on this page to remove it. This is a truly vexing issue… again causing myself (and others) to feel annoyed with Apple’s lack of consideration for workflow. Picking off obsolete and incorrect email addresses one by one is an abysmal solution. And IF you think you can create a “cloud” address to clean up the mess – IT WON’T WORK for anything but that address! Apple has you in a vice again. 1. Use a web browser to access your iCloud account. 2. Proceed as if to SEND an email – click as if to type in the recipient. 3. And then pick off those useless addresses – one by one. iPad iOS 10.2.1. I have the reverse problem in both Apple’s iPad email AND Gmail’s itPad gmail: my ipad Apple email omit one daughter in email autocomplete and my ipad Gmail omits the other daughter in Gmail autocomplete. Both daughters are entered exactly the same in my iPad’s Contacts. THEN, when I select and copy the other daughter’s Gmail address from the iPad’s Contacts, and attempt to paste it into the Gmail BCC line, the entire email EXCEPT the BCC line disappears. Is there anyway to disable the original senders name, address from the “From” line, leaving my name, address as the sender. I think this was only added in IOS 10.2.1. I am using the iPad mail app. I have searched high and low in Settings, etc. I can’t believe there isn’t a way to do this all at once. I have hundreds to delete. It is going to be quite timely to delete them one by one. In the search area key in the incorrect email address and click on it….will take you to the contact it is associated with. There you can delete it or correct it. This has taken me a long time to figure out but I was determined. In the search area key in the incorrect email address. Here’s what I did to remove incorrect email address from auto fill: go to contacts; key in incorrect email address; tap it, will take you to person associated with it n then u can correct it or delete it. Continued from above: after keying in the incorrect email address tap it; will take u to the contact it’s associated with n u can delete or correct it.